Our experienced team of six Veterinarians, headed by Dr Prevon Pereira and Dr Linda Davidge, along with Dr Daniel Edwards, Dr Claire Lowy, Dr Siobon Tang and Dr Marianne Hevern have a wide range of special interests and expertise allowing for a full range of diagnostic, surgical and medical treatment options. We also provide all routine pet care needs including, consultations, vaccinations, and routine surgery and dentistry. Furthermore Veterinary medicine and surgery is an ever evolving field. For this reason our senior veterinarians have undertaken further training in their fields of interest and all our Veterinarians regularly attend continuing education seminars and courses in order to be up to date with the latest treatments and procedures. Prevon graduated from the University of Melbourne in 1999, after which he worked in a busy small animal practice in Melbourne. In 2003 he worked for a short while in the UK and then returned to take up a position at Brandon Park Veterinary Hospital. Prevon is the senior surgeon at the hospital and became a partner and hospital director in 2007. Prevon thoroughly enjoys combining his veterinary skills with his management role, and his calm, easy going manner is well accepted by clients, pets and staff. 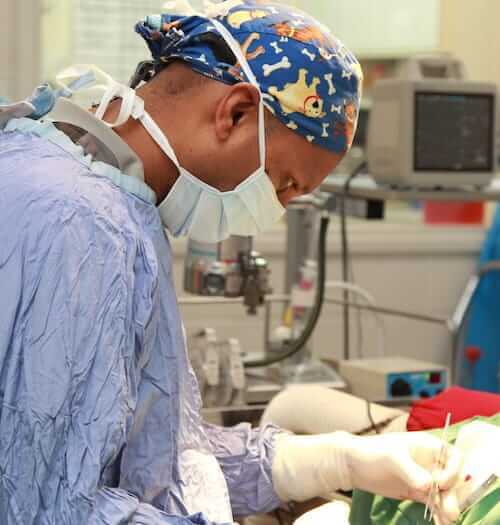 Prevon has a keen interest in small animal surgery, both soft tissue and orthopaedics, and has undertaken further study and training in this field. His other areas of interest include; treating and managing musculoskeletal problems, promoting canine rehabilitation programs and management of joint disease such as canine hip dysplasia. Prevon is a registered Penn HIP member (University of Pennsylvania’s Hip Improvement Program). Prevon has also been instrumental in the introduction of laser pain therapy to the clinic’s services. From a very young age Prevon has lived and schooled locally, graduating from Mazenod Collage. When time permits he loves his sport and enjoys watching and playing cricket, following the Formula 1, and is a passionate Bombers fan. Life away from work is dedicated to his family: wife Candice, cheeky little ones Mia and Mason, and fur children Marni and Bear the cavoodles. He also enjoys gardening and has a home full of birds, including 10 Indian ring-necks, Jeffry the talkative galah, Charlie “Houdini” the escaping cockatoo, Chilli the dancing cockatoo, and pet chickens (Winnie, Izzy, Sooty and Eleanor). Linda graduated from Massey University in New Zealand. She practiced in New Zealand before taking a three year working holiday in England and Europe. Linda then settled in Australia becoming a member of our team in 1992. Her outstanding Veterinary skills, good humour and infectious laughter have endeared her to many of our clients and their pets. Linda loves all aspects of medicine and surgery and has undertaken further study in the fields of animal behaviour and Oncology. She also has a strong interest in rabbit medicine. Linda and her Husband have two children, and an array of pets. There is Kazane the boisterous little Maltese Cross, Duma the cat who adopted Linda, and a farmyard with chickens. They also have a few alpacas, which have been steadily increasing in number (last count, six). The household also includes two pythons and a bearded dragon by the name of “Lady Elizabeth”. The latest addition has been Snow the white bull terrier. Snow was a rescue dog, who is hearing impaired. Linda has worked hard to training Snow with sign language. He is a very energetic boy who seems to still want to please despite his lack of hearing. Between work, the farm yard, and family commitments, Linda also manages to practice her love of Karate, she is a feisty black belt. Linda loves traveling and trying to learn foreign languages. 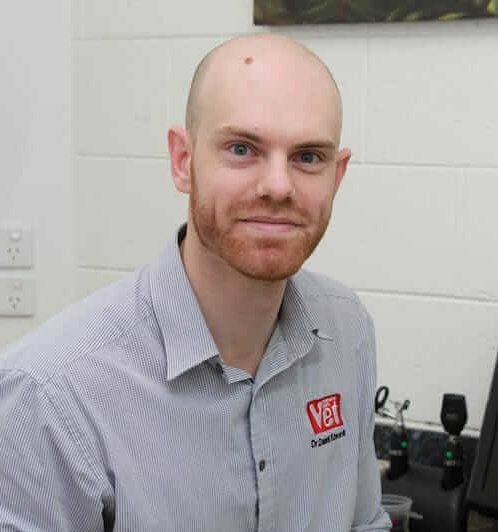 Daniel graduated from the University of Melbourne, and soon after started working at Brandon Park Veterinary Hospital in December 2005. Daniel has a very calm and assuring manner that both clients and pets respond to very well. His level of medicine, thoroughness and caring nature has made him a very important and experienced member of our team. Whilst his interests are widespread throughout medicine, Daniel has completed a post graduate through the university of Sydney in ultrasonography, and now has quite a lot of experience in diagnostic ultrasound. Dan has also complete his membership examinations in small animal Internal Medicine, in 2015, which has given him and the practice an added wealth of knowledge. In 2016 Dan and his wife Alison welcomed their little bundle of joy Owen., and in 2018 along came little Oliver. Daddy time has certainly filled his days off, meaning he does not get the same time to enjoy his other interests such as playing indoor football with his mates, but Dan would not have it any other way. Dan and Ali are the proud parents of a giant, yet cuddly Newfoundland by the name of Lilly. Claire graduated from the University of Melbourne in 2005. 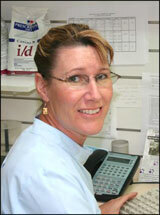 After working in a busy mixed country practice Claire joined our team in early 2007. It is not only Claire’s fantastic veterinary skills, but also her bubbly personality and compassionate nature that has made her a valuable part of our team. 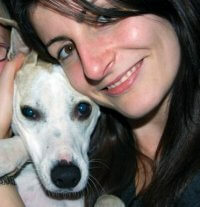 Claire has a keen interest in small animal surgery and has completed further post graduate training in surgery. Claire and her Husband Tim have two daughters Amelia and Grace who certainly keep them both on their toes. Claire has just recently returned from maternity leave to fill in a few shifts for us again. Claire has a strong client following who no doubt will be happy for their “Aunty” Claire to be back to continue looking after their pets. The other children at home include Red and Jack. Jack was a stray kitten that found his way to the clinic, Claire took him home to look after and he liked it so much he stayed. Red is the famous Fijian street dog who Claire rescued and adopted from a shelter in Fiji where she had volunteered in 2014 in Fiji. Red had a long haul through customs and quarantine but has settled into his new home and country very well. Claire is an avid North Melbourne supporter and enjoys watching a good game of footy, she also enjoys playing the piano in quieter times, and pottering in the garden. Her sporting passion however is netball which she still plays and umpires regularly. Siobon joined us in 2010 after graduating from the University of Melbourne in 2009. Siobon is one of our experienced vets now. and her incredibly friendly and courteous manner, along with her compassionate level of care is always well received by all our clients, a definite team favourite. In 2016 Siobon became engaged to her Fiance Alex who then jetted off to London to gain some valuable experience working abroad. She worked as a small animal Practice in London for 6months and also had the opportunity to travel around Europe, returning in early 2017. Whilst Siobon was already an integral part of our team, her time away has seen her return with a greater degree of confidence and maturity that now places her as one of our senior vets who display exceptional Veterinary skills, in particular her surgical skills are a real asset to the practice. Kathryn is one of the newer members of our team, having joined us in December 2017 after graduating from The University of Melbourne. Kathryn is originally from America – she completed a Bachelor of Science and undertook her Masters in Public Health at Michigan State University. She then relocated to Australia to complete her Doctor of Veterinary Medicine. Kathryn has a very compassionate and enthusiastic nature and is always willing to help achieve the best possible outcome for our pets and their owners. Her compassion for animal care extends to her days volunteering at “Pets in the Park Melbourne” on a regular basis, and the extra time she spends coming in to check on her patients. 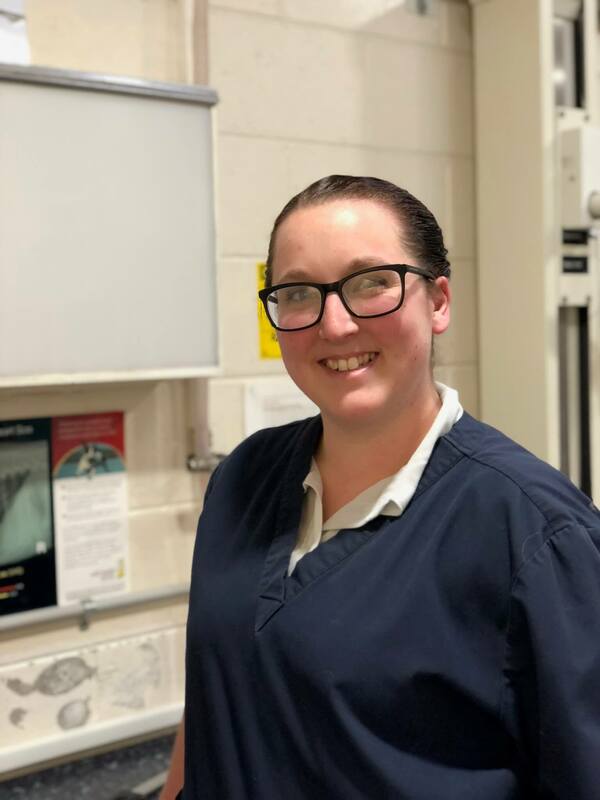 Sarah is the newest vet at Brandon Park Vet Hospital, having joined the team in February 2018. 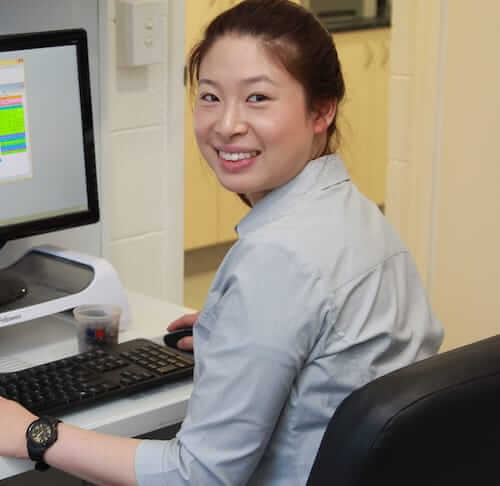 She grew up in Victoria’s Grampians region, and completed her Bachelor of Veterinary Bioscience and her Doctor of Veterinary Medicine at The University of Adelaide, graduating in the class of 2016. Though she enjoyed life in South Australia, she’s very glad to be back in Victoria. 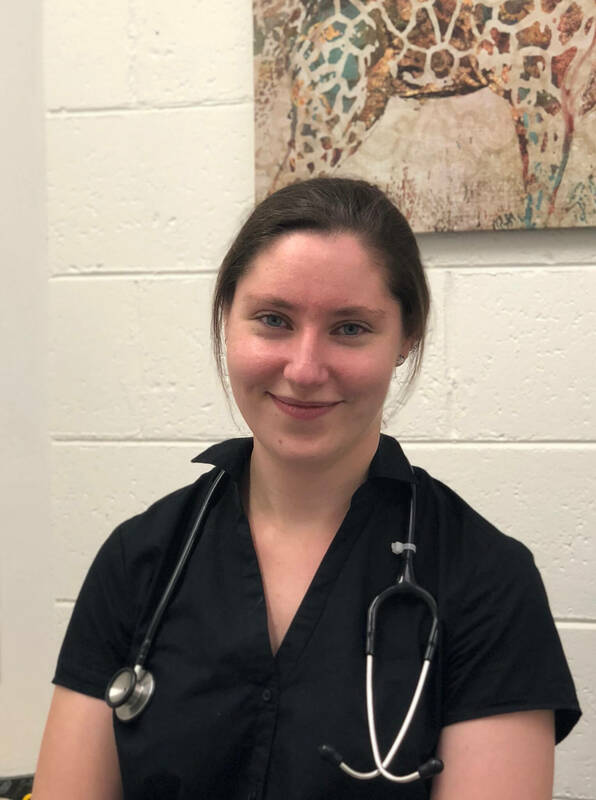 While Sarah is passionate about all areas of veterinary medicine, she particularly loves working with cats, and is hoping to learn a little more about the weird and wonderful world of “pocket pets”. Sarah is a brown belt in karate, loves to bake, plays video games, and has recently taken up knitting – but she has to keep those tempting balls of yarn away from her naughty tortoiseshell cat Vanilla!